After completing a successful tour, Miss BonBon Bombay is back in her hometown to entertain! November 10th- Bain Mathieu 8pm with The Unsettlers, burlesque & circus! Special Prohibition Evening at Ye Olde Orchard Pub (1189 De La Montagne) to raise money for Prostate Cancer. 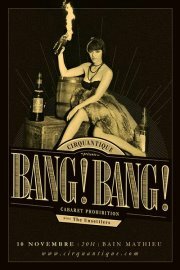 BonBon Bombay is producing the evening and will be bringing along many great guest to entertain you for a good cause! November 30th- BonBon Bombay and The Blue Mushroom Sirkus Psyshow will be setting the mood and entertaining EO Montreal during there private function –oh are they in for a surprise! !